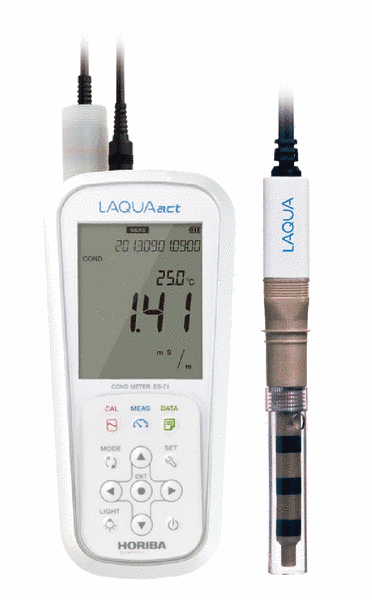 The one hand operation easy to carry conductivity meter available from Horiba is this LAQUAact ES-71 Conductivity Meter. Measures electrical conductivity and resistivity, total dissolved solids and salt content and has conversion functions for the measurements mentioned. This easy to use meter has automatic range switching, temperature conversion and unit switching functions. Horiba's LAQUAact Conductivity Meter ES-71 is the one you want, when it comes to measure conductivity in outdoor conditions, but is nevertheless very much applicable in the lab too. This shock-resistant, water- and dustproof portable meter has the functions you want in measuring conductivity in water. The large easy-to-view display shows the readings clearly and backlight LCD allows visibilty in dark places. Measures: electrical conductivity (EC), electrical resistivity (ER), total dissolved solids (TDS), Salinity. Power: AAA alkaline batteries or Ni-MH batteries or AC adapter.